Love the card, this is a perfect guy card!!! Love the bright orange paper and great embossing on the golf ball. Gorgeous Card! i love the golf ball!! This is a fabulous card! Love the grass and the orange background. What a terrific card. TFS. omgosh, this is adorable! i love how you cut out the circle and embossed it to look like a golf ball - genius! Such a Clean and crisp Card. 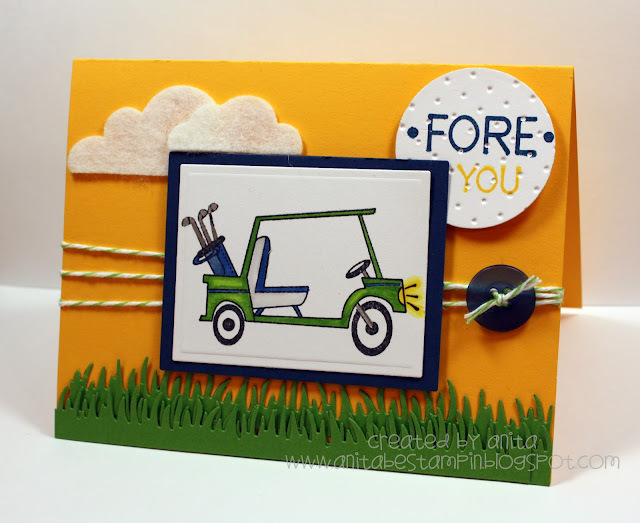 Love the embossing,colors & the Stamp looks just perfect for a Guy's Card! Lovely bright card! Neat and crisp! OHMY Word! Love this card lots! I love the gold ball and the bright colors. OH MY WORD! You embossed the golf ball! Brilliant! I love it! Love the golf ball FORE!! Your card made me smile..Thanks for that.